It’s late, you’re tired, you really need a vacation. You’ve given everything you have to the business but you’re ready to move on. Maybe you have a different idea; perhaps you’re ready to retire, or maybe you are just over seeing little return with so much physical and emotional investment. Like many small business owners, you might just be tired of losing money every month. Never mind why – the fact is, you have decided to sell your business. What’s next? Let’s discuss. Most articles will advise you to prepare your closing at least 6 months in advance. But what if you don’t have 6 months? If your business is anything but profitable, you will want to get out as soon as possible with as little financial damage as possible. If your business is not paying you a wage you could earn elsewhere before being profitable, it isn’t really profit. In fact, it is nothing more than a reduced salary. Online auction platforms provide a way to quickly and effectively recover potential loss from your business. These sites handle the entire process from start to finish, freeing up your time to prepare for your next venture. But before we get into the method online auction offers, let’s talk about the options. First, Option 1: the Do-It-Yourself. Most business owners will attempt to sell the business on their own, and why not? They know the ins and outs, they don’t want to pay someone else to do something they would like to think they can do on their own. It seems easy enough, list it, find a buyer, sell it. But today’s economy isn’t necessarily a new-business-friendly place, and if you have not been able to make your own dream work, how can you expect the next person to? Let’s discuss what’s involved in this option. The Do-It-Yourself option will invariably bring the tire kickers, the lowballers, and the window shoppers. You’ll throw a listing on the internet, maybe even advertise in the local paper. Your phone will ring, almost always with the same questions – Where is the business? Is it currently making money? Why are you selling? Do I have to stay in the same location? Will you take (half of your asking price)? Some of these folks may even make an appointment to see the business or discuss financials. If they do show up, the majority of them are not serious, not ready, or not qualified to buy. If you have ever been to a real estate Open House, how many people show up? Out of dozens and dozens of people, the realtor can only hope just one will make an offer – and it’s almost never for the asking price. In addition, how many homes are sold fully furnished? Most people like the idea of the place but they want to bring their own vision in – just like you did when you started your business. In a recent survey conducted by the listing website Businesses For Sale (www.businessesforsale.com), 62 percent of the business brokers responding stated that it took them nine months or more from listing to sale. Only 28 percent reported that it took six months or less from listing to sale. Related: How Long Does It Take To Sell A Business? So now, you’ve spent a few months trying to sell on your own. You have gotten no real offers, and in the meantime, you are losing motivation to run the business you want out of. Your profits are decreasing or worse, you’re making loss, your staff isn’t as efficient as they used to be, and your business ratings are dropping because people are noticing. You are tired of answering the phone for people who are not serious, and now you are ready to list with an agent. That takes us to Option 2. Option 2: A listing agent. You’ve found a business broker you want to work with, and you sign a contract with him to sell your business. Your agent has a minimum of 15-20 other business he is trying to sell. He has no special interest in marketing your business, no personal attachment and no particular incentive. He is not spending his days working your business and he’s not staying awake at night wondering how the bills will get paid. He is marketing your business to hundreds of other business owners – all of whom already understand the ins and outs of owning a business, and can read a profit/loss statement fluently. These entrepreneurs may realize the possibilities of your business but are also aware that something must not be right or you would not be selling it. They are not interested in giving you the full value of your business because they know there will be work involved in getting the business to full operating potential. After a few months of trying to sell, you have come to a point where you would be happy if someone just took over so you could spend a weekend doing anything but crunching numbers. You have been trying to sell for so long you are ready to jump on the first offer that comes close to you breaking even. Option 3: Online auction. Now that you have decided to sell your business, and you want out with the most financial gain, as soon as possible. You may ask, what’s the difference between an online auction and an in-person auction? Simply put, the amount of recognition your auction will garner online is exponentially larger than the amount of people who will show up to your business at a set time, normally during business hours when they should be at work, hoping the weather will keep. An online auction emulates a live auction while people can bid from the comfort of their own homes. This also gives more time to assign larger value to your pieces. The convenience of shipping and delivery alone will often make the difference in whether someone chooses to purchase or not. Now, you could do a liquidation sale, or "asset recovery clearance". This would entail you being the facilitator of each sale, answering the phones, showing up each time someone might be interested in maybe an item or 3. The first few pieces will sell for fair market retail – and then, interest will dwindle. You’ll start taking cut-rate prices for your items, maybe even offering a bulk discount. In the end, you’ll be left with the leftovers – a bunch of stuff nobody has much interest in, and everyone’s tired of hearing about. It’ll all get thrown into a storage unit where your monthly rent will begin to eat into all of those sales you worked so hard to get. Eventually you’ll let the unit go, or post a big ad under FREE STUFF titled "Come and get it out of here". Or worse, you’ll put it into your garage where it will sit and rust, taking up valuable space you really needed for better things – like your car. So, you choose online auction with a qualified company. You contact your chosen facilitator and schedule your auction. You’ll want to use a company that has all of the necessary training, tools and equipment to facilitate an online auction either on-site or off-site in one of their secure warehouses. AuctionHub will prepare and clean every item so that it reaches its maximum revenue potential (after all, the more money they make for you, the more money they make in general). Every item is photographed and professional copy is written for each description. Each lot is listed individually so that only those with interest in the actual item will place a bid, as compared to assigning decreased value on things they don’t really want or need. At this point, an aggressive advertising campaign should begin across the nation for your auction - be sure to find a company that will foot the bill for this advertising. Every time the phone rings with questions about your auction, someone from the company’s professionally trained staff will answer and direct them to your auction on their website. Every registered bidder on their site has been verified through their secure online portal and is qualified to buy so there is no worry of ghost bidding. They provide a full day for interested parties to come and view the items in person – and when those days come for other auctions, your items are set up for viewing as well which will provide even more interest in your auction. On the day your auction ends, an email is sent out to the company’s bidder base of thousands of registered buyers. Each item will end individually, one to three items per minute. In the event of a last minute bid, the item is extended up to 10 times to give other buyers the opportunity to bid even higher. Every single thing will sell, from the largest piece down to the leftover disposables (yes, everything – if it is something you needed once, it is something they need now!). During the ending staff remains on the computer and by the phone to ensure a smooth end to the auction. After the auction is over, all of the invoices are emailed to the winning bidders, and the administrative staff begins to collect payment from those buyers. Usually, the day after the auction is pick up day. People will drive hours and hours for the convenience of buying so many different things in just one place! Buyers will arrive throughout the day to pick up the items they have purchased and paid for. Staff will be on hand to provide assistance in loading their purchases. For some items, shipping will be set up on this day. Your chosen company should have all of the necessary tools and equipment to prepare large shipments, including items needing to be shipped on pallets. They will carefully load each piece onto the shipping trucks and collect the necessary paperwork to ensure every shipment is handled and delivered correctly. For smaller items, most companies will carry good relationships with FedEx, UPS and USPS. They will carefully wrap and package each item (combining items for shipment as possible). The items will then be shipped to their respective buyers along with a provided tracking number. 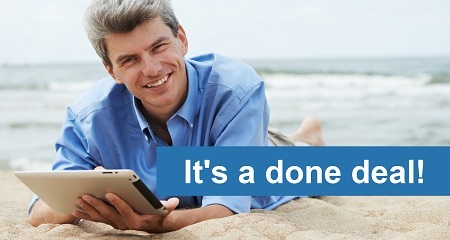 Finally – your auction is over. Now begins the necessary exit paperwork to finalize your contract. An itemized printout of each sale and expense is provided along with your payment. And just like that, you are paid and ready to move on to your next venture. This option provides a stress-free way to a better end result for you. Instead of a year of aggravation, you have sold your restaurant in its entirety in just a month or so, with guaranteed funds. "What was the point of working so hard in order to have a payout if I wasn’t going to use that freedom to pursue something that I had always dreamed about doing?" – Amy Rees Anderson, Life After Selling a Business. So what’s the difference between on-site and off-site? If you are up to date on your lease, or you own your building, an on-site auction is the quickest and easiest route. The items are all set up within their current location, and you can advertise the auction to your current customers to garner even more local interest. There is less labor and therefore less time involved before the auction is live. However, many business owners are either behind on their rent, or at the end of their lease. Moving your auction off-site to one of their secure warehouses also eliminates the need for "one more month’s rent". They have the capability, tools, staff and truck to safely and efficiently remove all of the furniture, fixtures and equipment from the business location to one of their own locations to prepare and conduct the auction. Additionally, moving the auction off-site provides a more efficient transition for shipping and delivery, especially of larger items and orders. Think of online auctions like this: You’re looking into buying a house. The asking price is just what you wanted, but the sellers want to throw in all of their furniture, their dishes, pots and pans, the bath towels, even the guest bed – with linens. Because of this "bonus", they’re increasing the price by several thousand dollars. Would you pay more for your dream home because it included someone else’s dream furnishings? Or would you rather pay for the house and spend your money on just what YOU want, what YOU need for your home, something that showcases your tastes and personalities. Chances are, you don’t want to step into someone else’s dream – you just want the space to start living your own. Most new business owners feel the exact same way – and they’ll assign a much greater value to items you’re selling if they are buying them because they actually want them – not just because they were thrown into the package. So, there are your options. It is always going to be in your best interest to move as soon as possible toward whichever direction you decide to take. Remember that time really is money, and only one of those can be recouped. In the long term, online auction is the best route to save both.